Casper recently announced plans to open 200 stores in Canada and the United States, as well as expand experiences and branded goods, to bring its sleep products to a larger breadth of consumers (link to news articles at end). 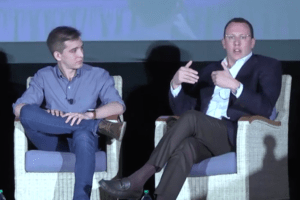 Philip Krim, CEO and co-founder of Casper, shared insights into his company’s success at the 2018 GRMA C-Suite Executive Leadership Forum, serving as a speaker on the CEO Panel (pictured at far right, with Jesse Horwitz, Co-CEO of Hubble). Casper tested the field for four years as an online outlet with periodic pop-up stores but now is embracing brick-and-mortar. Krim told Business Insider, “We do not think there is anything near the death of retail, but we do think that there is a death of poor retail,” Krim said. Casper’s intent is to be the antithesis of that experience. Philip Krim is one of five co-founders of Casper, which launched on April 22, 2014. Krim learned about mattresses from an e-commerce company he started while he was a student at the University of Texas. “We found there was no global sleep brand out that really stood for something more, that connected with consumers, more deep about sleep. When we did our focus groups, we found maybe they would recall their brand, but they had not idea the model, and that’s very much the industry dynamics,” which Krim called the industry “consolidated” and “opaque,” where consumers don’t have transparency around pricing, promotion, product. And they do this so they can drive high margins and overall that resulted in a very poor consumer experience.